I hope that you are all having a very blessed and holy Good Friday. I am feeling quite melancholy today, and it ties into the suffering theme of the day, I suppose. I've known for a few weeks that the daughter of a good friend was diagnosed with cancer. It's been heavy on my heart, and the news coming out from the hospital via Facebook has been increasingly difficult, particularly today. They received some bad news yesterday. I'm just beside myself, and I can only imagine what her parents are going through. She's just 14, and her name is Julia. Would you wing up a prayer for her health and healing on this Good Friday? It is much appreciated. On that solemn note, I'm not really in my happy writing place like I usually am when I compose these posts. So I'll keep it brief. But I did attend the Holy Thursday liturgy yesterday, and Henry accompanied me, which meant so much to me. It was an absolutely beautiful Mass. And my very favorite part? The end, with the Eucharistic procession, incense, and repose of the Blessed Sacrament in the side altar. And then the dramatic departure of the priest and deacon without a word. WOW. Powerful stuff, right there. 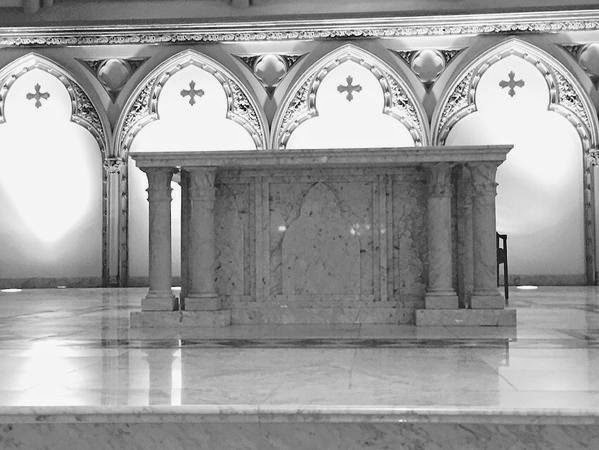 I know that when Anne and I arrive for the Good Friday service at 3 pm, the altar will be bare and the main tabernacle open and empty. Very stark, and fitting. I'll be home with the kids again on Monday, but I'll be sure to post about Easter weekend. I'm aiming to attend both the Vigil Mass and Easter morning. #Catholicnerd Until then, I hope that you all have a prayerful end to the Triduum and a beautiful start to the Easter season. Talk to you all on Monday. I'll pray for them and add this to the list of prayers the Tumblr Catholics are praying for! Im so sorry to hear about Julia. Sending prayers for her comfort and healing. Thank you so much to you both!